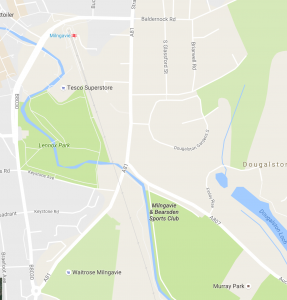 Midweek club rides start from Milngavie & Bearsden Sports Club (see map below), which is a short bike ride from the station. There’s no need to join GMBC to come along to your first few rides. The routes and durations vary to suit the conditions & those present. Tea, biscuits, changing facilities and bike wash are available afterwards. All you need is a well maintained off road suitable bike, a spare tube, pump and multi-tool and some enthusiasm. It’s always great to see new people out. So if you’re a new rider then please contact info[AT]gmbc[DOT]org[DOT]uk to let us know you’re interested and check out the what to bring page to make sure you’re prepared. Other mid-week rides may be organised on an ad hoc basis so keep an eye out for updates on the website. « Volunteers wanted for Hoy Velodrome – have fun, watch fast cyclists, feel smug.